An accomplished nature and wildlife photographer, Jim Clark, presented the concept of sense of place in a photo workshop I attended. It's really about how to share with the viewer the essence of the place as experienced by the photographer. It also sets the context for the images that follow. I decided to do that with a venue I'd visited in the 70s and have returned to for the past four years, the Upperville Colt and Horse Show. My challenge was how to show that amongst all that activity and crowds of spectators, it really comes down to the individual rider and mount doing their best in a beautifully pastoral setting. It is a show known for being 'under the oaks'. I found the location I wanted, set up my tripod-mounted camera to capture the setting, and waited for the perfect shot. I almost waited too long, for this was the last entrant of that class going over her final jump. But I got what I wanted, and here is my sense of place for the Upperville show. 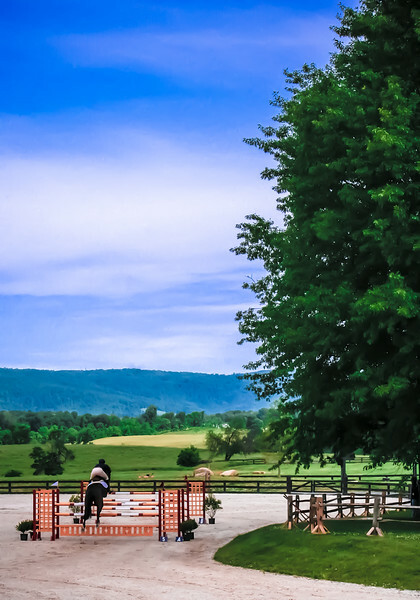 To see the whole Upperville Colt and Horse Show gallery, and other similar ones, click on the image.